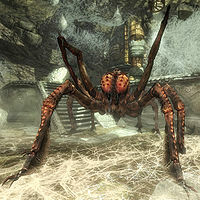 Nimhe is a giant frostbite spider living in Nchuand-Zel, an ancient Dwemer castle located deep within a mountain behind Understone Keep in the city of Markarth. According to Calcelmo, who has been placed in charge of curating artifacts recovered from Nchuand-Zel, his workers had come to regard the giant frostbite spider as such a significant threat that they decided to name her "Nimhe", which translates as "The Poisoned One". She spends her time waiting in ambush in a large hole in the Excavation Site ceiling just before the entrance to Nchuand-Zel. The corpse of Alethius that lies near her lair is clear evidence of the challenge Nimhe has been presenting to Calcelmo and his workers. Nimhe can be encountered before acquiring the related quest from Calcelmo by picking the lock on the excavation site door. "Nimhe" is Irish for "poisonous". Nimhe respawns, despite being a unique creature. This page was last modified on 4 April 2014, at 07:56.